When considering Aztec clothes and what the common people wore, it is first important to understand how very diverse the Aztec empire was. It covered a great deal of land in what is now Mexico and beyond, but more than that, it was composed of many different tribes and nations of people. As it was a system of tribute, where goods were sent from one group to display submission and loyalty to another, rather than a nation that was bound together by a specific identity or uniform, it is important to remember that what one member of the Aztec empire wore might be very different from what another member of the Aztec empire wore. If you are looking at Aztec clothes, it is important to think about what they were made out of. Spinning, weaving and dyeing were all important crafts to the Aztecs, but unlike Europeans, they did not take the wool from sheep to do their spinning. Instead, they might make clothes from imported cotton fibres or from ayate fibre, which is derived from the maguey cactus. These fibres could be pulled from the plant and then spun into thread or yarn. This yarn could then be set on a loom and woven with. 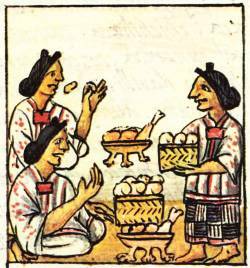 It is generally believed that the ancient Aztecs wore their clothes as bright as they could afford, and there were many natural plant dyes that were available to them. How did the common people dress? The common people of the Aztec empire dressed very simply in contrast to their nobility and their priests, who might be very highly decorated with furs or other adornments (more on the ancient Aztec clothes worn by other members of society). Men, for example, mostly confined themselves to a loincloth. Made from a single long strip of fabric that was then tied in front, the loincloth might be the only thing that a man wore. A man with an unadorned loincloth would be of fairly low rank, perhaps even a slave, where a man of higher rank might have embroidery or decorative fringe on his loincloth. A man might also wear a kind of triangular cloak, known as the tilma or the tilmatli. A woman would dress a little more elaborately in a sleeveless or short-sleeved shirt, combined with a long skirt. 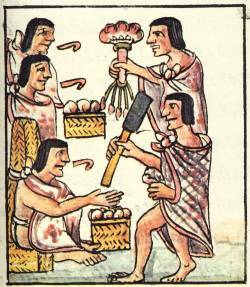 There was no tailoring done, and it is generally believed that Aztec clothes came right off the loom, ready to be worn. Holes for the head or arms were simply woven into the cloth, while the skirt would be a long strip of cloth that was wrapped around the body. There was still a lot of variation that was possible with even this simple design. Women of different regions might choose to pleat their skirts in different fashions to create a garment that had a different look or drape, or they might simply let it fall in a cylinder to the ground. Aztec clothes were fairly simple, but they certainly did the job when it came to keeping the men and women of this empire warm in the varied Mexican climate. While there was a great deal of variation in clothing throughout the Aztec empire, these were the basic garments that were worn.